One app that I learned about, Undebt.It, really stood out to me. It’s a free debt management app that helps you to inescapably and efficiently track all of your debt. The bottom line is that this is the most powerful tool that I’ve seen to help you choose the right debt payoff plan to work on. Ever wondered how you can calculate your debt payoff date based on your debt snowball? Join me as I go through how I calculated our potential debt free date. I will show how I took all the information from our debt snowball and entered it on a website that caluclated this date for me. It didn't take me long to find Undebt.it, a cloud-based program to help you keep track of our Debt Snowball payment plan. While it has a Premium plan that beefs up your account with added features like SMS payment reminders, monthly account summaries by email, historical tracking and reporting, and other enhancements, I've found the free plan to be robust and more than adequate for my needs. Undebt.it immediately jumped out at me. Undebt.it is an online debt manager that will help you get the bills paid off. 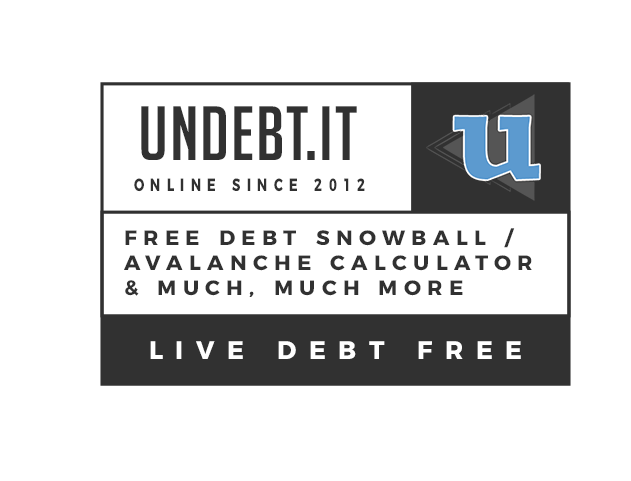 I happen to be a big fan of the debt snowball (paying lowest balance first) & debt avalanche (paying highest interest first) methods to get out of debt, so a free online tool to manage my snowball has my interest. Undebt.it helps you as you journey on your way to being debt free. Basically, it helps you eliminate your debts by using a method known as the debt snowball. To get started, you tell Undebt.it some important information, i.e. your monthly minimum payments, interest rates and current balances. Then the site helps to create payment plans that can be automatically adjusted whenever changes are made. You'll be able to see when each debt will be paid off at your current rate and you'll also be able to make extra payments to speed up the snowball. I just want to tell you this is the best money management site ever, I have done all of them YNAB, mvelopes, quicken, dave ramsey. Yours is the easiest to understand, and work with. GREAT JOB ! I wanted to pop in and say thank you for the Undebt tools. It really is just what I've been looking for! Although I have just signed up today, I am excited to get started. I know it will be an invaluable resource to my husband and I as we get our finances in order. Overall, I am impressed with the professional look of the website... I believe the site you came up with is going to be very helpful to us, and I know a lot of hard work has gone into it.